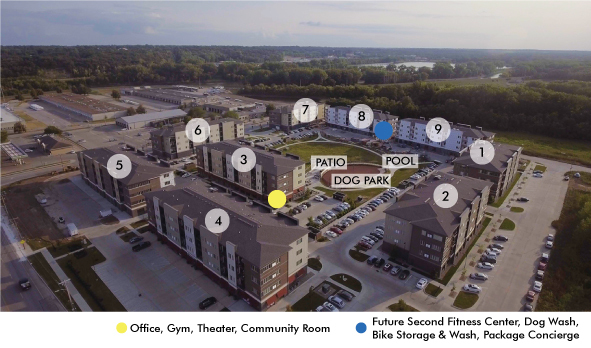 At Cityville, the energy of Des Moines is right at your fingertips with the space and amenities of the suburbs, and quick access to area hot spots like Gray's lake, bike trails, and baseball at Principal Park. Located on 9th Street between Raccoon River and the heart of Downtown Des Moines, Cityville is a thriving apartment community that offers comfortable living options and a connection to the heart of the city. Urban living has never been more appealing. Close to Downtown: Located just south of Downtown Des Moines on 9th Street. Space like you're living in the suburbs: Stay in the heart of the city with amenities typically found in the suburbs. BCycle Bike Share Access: Ditch your car and commute with a BCycle bike. Entertainment: Watch a local or Broadway show at one of Downtown Des Moines' entertainment venues. Dining: From local breweries to upscale dining, find a variety of cuisines in Downtown Des Moines. Outdoor Amenities: Go for a run through the city streets, or enjoy a bike ride through the area's trail system. Downtown Des Moines has transformed into a lively, cultured city over the past 10 years. And living at Cityville brings the pulse of Downtown to your front door. Located just south of the Court Avenue district, Cityville is just minutes away from Wells Fargo Arena, Principal Park, Pappajohn Sculpture Park, the Des Moines Civic Center, Temple for Performing Arts, Western Gateway Park and more. Residents also have convenient access to Downtown businesses, local restaurants, nightlife, music and nature. And while you're at home, enjoy the amenities of a vibrant apartment community. Fully equipped with two 24/7 gyms, a theatre, games, a full kitchen and conference room, the Cityville community room has something for every resident. Start your day with a cup of coffee, and end it playing games with your friends.